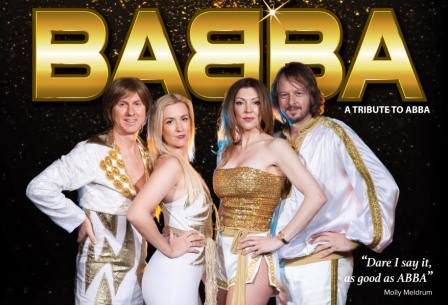 BABBA is the most exciting and musically accurate tribute to ABBA in the world. In a spellbinding performance of all the hit’s BABBA takes you on a musical journey that will have you on your feet uncontrollably! Since 1994 BABBA have performed all over Australia, Asia and New Zealand to sold out audiences and rave reviews. Benny, Bjorn, Agnetha and Frida have returned (with the help of a cryogenic freezer and some cosmetic surgery) to transport you back to the 70s with a show full of humor, great costumes, Swedish accents and fun-filled dance floor action. With spine tingling harmonies and a band that will rock your socks off, BABBA is simply the best night out! This is the only gig for Babba, better be quick!